Today’s Full Moon at 3° Taurus is in the sign — and at the exact degree — of its exaltation. The Full Moon lights up the night sky so brightly that it makes it difficult sometimes to see the Stars. But that doesn’t mean they’re not there. 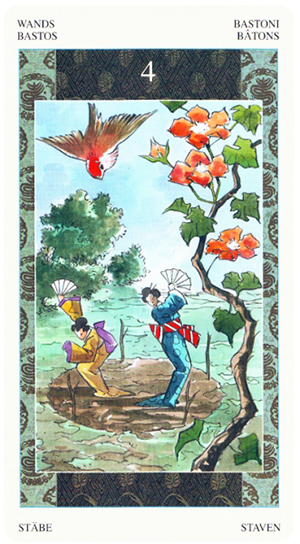 Look at the figure in this card — from the stunning Samurai Tarot. 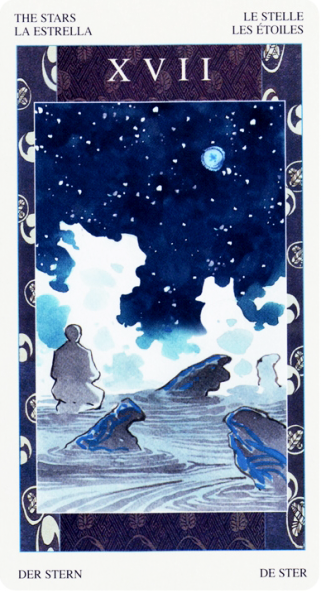 He kneels down in a shallow tide pool and gazes up at the night sky, only to be rewarded by its panoramic splendor. This card is about getting perspective. Putting your faith in the Universe. Seeing where you fit in in the Cosmos. Getting in touch with your own capacity for awe and reverence. And feeling inspired by nature and the beauty that surrounds you. Notice how ocean spray seems to come to life in this image, brought on by the glow of the Full Moon and stars. Animal and human figures take shape, only to shift and change before your eyes. (For me what started out as a ceremonial dragon turned into Samurai warrior and oriental lion). This tells you that things aren’t always as they appear and that you do have some say in the reality you create. 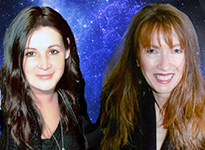 This card is all about synchronicity and serendipity. It’s a card of Hope and Faith in the Universe. It tells you that in spite of all your trials and tribulations, everything is as it should be, and in the end everything is going to be alright. It invites you to open your eyes and see the vastness of the world around you, the billions of stars in the night sky and the billions of people that make up humanity. It comes as a reminder that even in in the midst of all the chaos that surrounds you, there is still room for growth. There’s still love, peace, beauty, harmony and compassion. There’s still the promise of forgiveness, redemption and salvation.